uMG, "Funkmessgeraet," "Freya" radar. Eight Freya radar units were deployed along the western German border in 1938. 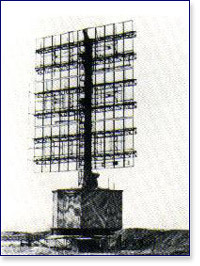 This was the first operational radar systems. The Freya and Seetakt radars were built by the GEMA company and over 6,000 units were used during WWII. Harry von Kroge has written an excellent book titled, "GEMA: Birthplace of German Radar and Sonar." Available in English from the Institute of Physics. Phone 800-632-0880. One of tne of the last "fathers of radar," Paul-Gunther Erbsloeh, died on the 18th of February 2002 at the age of 97 in Berchtesgaden, Germany. He and his friend, von Willisen, were the founders of the GEMA Company. Their story is in the book "GEMA: Birthplace of German Radar and Sonar." A new book called "Hans Erich Hollmann, Pioneer and Father of Microwave Technology" by M. Hollmann is available by calling 831.649.6212. Electronic Genie, The Tangled History of Silicon by F. Seitz and N. G. Einspruch, University of Illinois Press. 1998. from Borders. Great book about the history of electronics. A chapter devoted to Hollmann's contribution to radar. Free down-loadable books The Radar War and History of Radio Flight Navigation Systems in English.